Happily the rain has gone. Now we have grey skies, so here's a shot from the cemetery, taken in November. 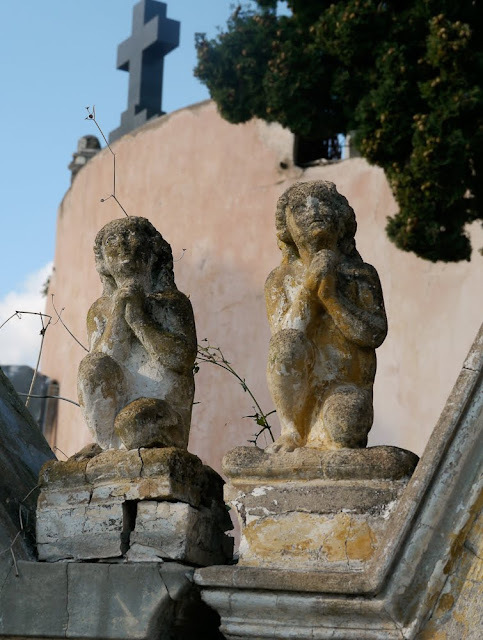 Two weathered cherubs - or are they angels? - who oversee a rather run-down tomb. Heureusement la pluie a cessé. Maintenant, nous avons un ciel gris, alors voici une photo du cimetière, prise en Novembre. Deux chérubins rongés par le temps - ou bien sont-ils des anges? - qui gardent une tombe plutôt délabrée. They look like they are praying Jilly. Life goes on daily. We push forward... towards the end and the beginning. HNY 2011. I know those ones, I have someone to visit not far away.. I wish you a good entering into 2011, dear Jilly!Bon réveillon, et très bonne année! Angels? I love to think they are Angels. A very very Happy New Year Jilly !!! Thank you for those kind wishes, Jilly. In return, mMay I wish you a happpy and healthy 2011, Jilly. And may it also be a romantic year for you, in the full sense of that word. I am looking forward to what this year brings very much, as I will spend two separate months in France, and my grand-daughter will celebrate her first birthday and my father his 90th birthday. Thank you for all your beautiful photos Jilly. Have a peaceful, terrific new year! Happy New Year Jilly, Thank you for a year of wonderful photos which have brought us great pleasure. Love from us both. Happy New Year also to all the people whose comments I read and enjoy. Happy New Year, Jilly! I hope it is full of wonderful photo opportunities for you - and for all of us. I love these angels. Happy rain_and_clouds_free New Year to you and yours!